When Milton and Marlo Fauster die in a marshmallow-bear explosion, they get sent straight to Heck, an otherworldly reform school. Milton can understand why his kleptomaniac sister is here, but Milton is—or was—a model citizen. Has a mistake been made? Not according to Bea “Elsa” Bubb, the Principal of Darkness. She doesn’t make mistakes. She personally sees to it that Heck—whether it be home-ec class with Lizzie Borden, ethics with Richard Nixon, or gym with Blackbeard the pirate—is especially, well, heckish for the Fausters. Will Milton and Marlo find a way to escape? Or are they stuck here for all eternity, or until they turn 18, whichever comes first? ©2008 Dale E. Basye (P)2010 Blackstone Audio, Inc. The reader makes all the difference sometimes, and Bronson Pinchot is masterful at creating distinct voices. It was sometimes hard to believe that only one person was reading! The story is a bit light and corny for my taste, but it was original. 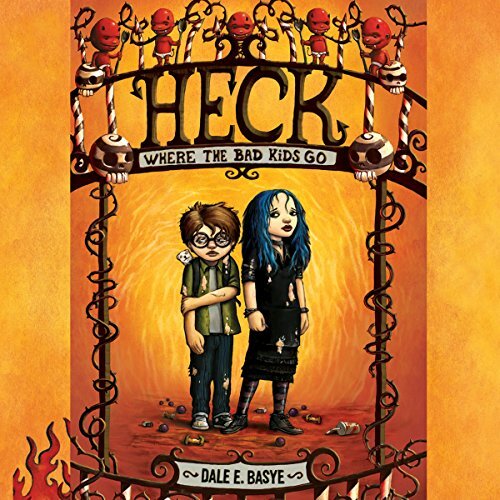 Marlo and Milton are sent to Heck, which is a kind of limbo exclusively for children, populated by a corrupt bureaucracy of flawed demons administering offbeat punishments such as locking away the phonics lessons from the kids who are "hooked" on them and forcing boys to wear humiliating clothing such as lederhosen. I would imagine this story appealing most to a fanciful ten year-old, but I stuck with it because I was so entertained by the excellent reading. It is such a creative series and the writing is hysterical.